Straight skewers, nine 7.2mm holes. Sportman hub flanges have 9 holes instead of 8 on the Nuovo Tipo. 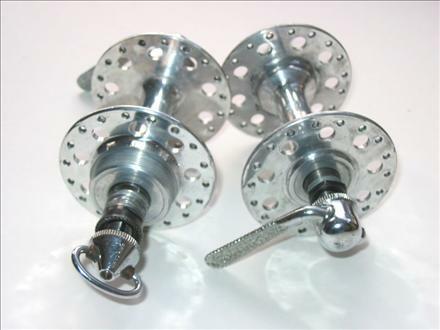 The flanges of these hubs are 68mm diameter. Peter Adler: " The flanges aren't as high as the Gran Sport/Record/Nuovo Tipo; they're 68mm diameter, instead of 75mm. The holes are smaller than the round holes of the Nuovo Tipo and the large holes of the Gran Sport; 7.2mm instead of 10mm. The bearing covers are flat-sided, as are the transitions between the hub body and the inside of the flanges."